Karen Tse, Founder & CEO of International Bridges to Justice. 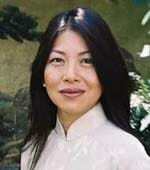 An international human rights attorney and ordained Unitarian Universalist minister, Karen Tse has been pioneering Rule of Law initiatives in Asia and Africa since 1994. As a United Nations Judicial Mentor, she trained judges and prosecutors and established the first arraignment court in Cambodia. IBJ has trained hundreds of defense lawyers in the 31 provinces of China, as well as in Cambodia and Vietnam. Karen says: “We envision a world without torture or unjust legal proceedings, and we work every day to achieve this end.” This work is not for the faint of heart. Where does she find the courage to engage in this human rights mission in the face of potential personal danger? Karen’s advice: “You have to start from your center. It's from that place of stillness where you'll know how to move forward.” Listen to this episode of Leading Conversations with Cheryl Esposito to learn more.